Ten days ago, one of the females from the founder herd of the European bison roaming the Tarcu Mountains for over a year now, gave birth to a healthy calf. The now 7-year-old female bison arrived in the Southern Carpathians rewilding area in Romania in May 2014 as part of the reintroduction and rewilding initiative led by Rewilding Europe and WWF-Romania. 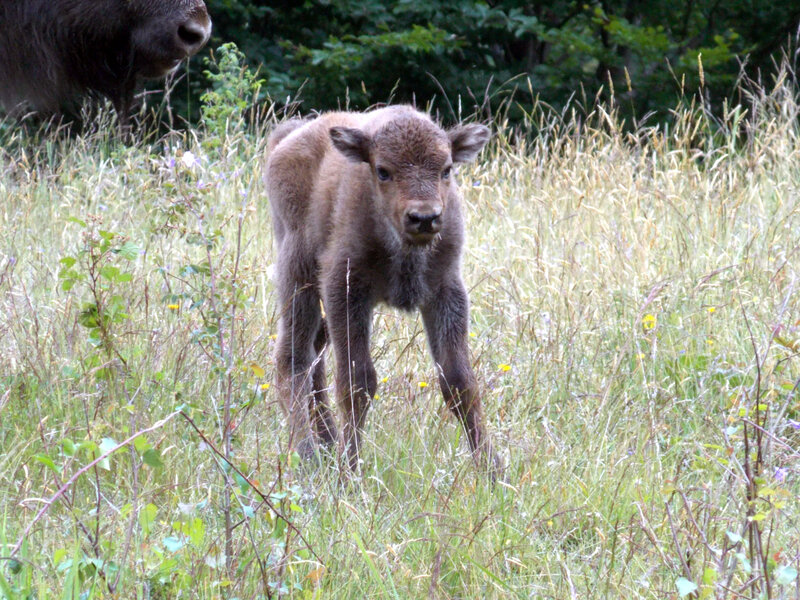 Bison calf born in the wilderness of Tarcu Mountains, Southern Carpathians rewilding area, on 20th June 2015. The little bison bull is the first bison born free in the Southern Carpathians this year. The mother originates from Wisentgehege Springe (Bison Park) in Germany. Mother and calf are healthy, look well and are in good condition. 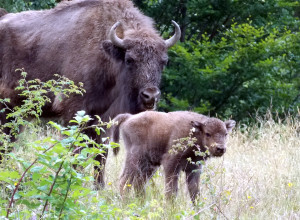 This news come just two weeks after the birth of the first bison calf in another rewilding area, the Rhodope Mountains in Bulgaria. The timing of these births is not accidental, but a sign of good adaptation to their new habitats. The births of this offspring show how the mating behaviour is regulating and becoming more natural given that spring and early summer are the optimal times for bison to have calves. In another reintroduction site managed by Vanatori Neamt National Park in Romania, five calves were also born this spring. This is a good indicator that the Carpathian Mountain Range and its moderate climate is a very suitable environment for the comeback of this legendary species into the wild. The founder herd released in May 2014 in the Tarcu Mountains adapted well to the area. This June a second release took place and the number of animals doubled; an important next step to create a viable population of free roaming bison in this Natura 2000 site. Monitoring of the bison herd in relation to their new habitat shows that the animals, while forming a solid social herd structure, are rediscovering their wild side again and are regaining the necessary survival skills for life in nature. Mother and newborn calf exploring the Tarcu Mountains, Southern Carpathians, Romania. 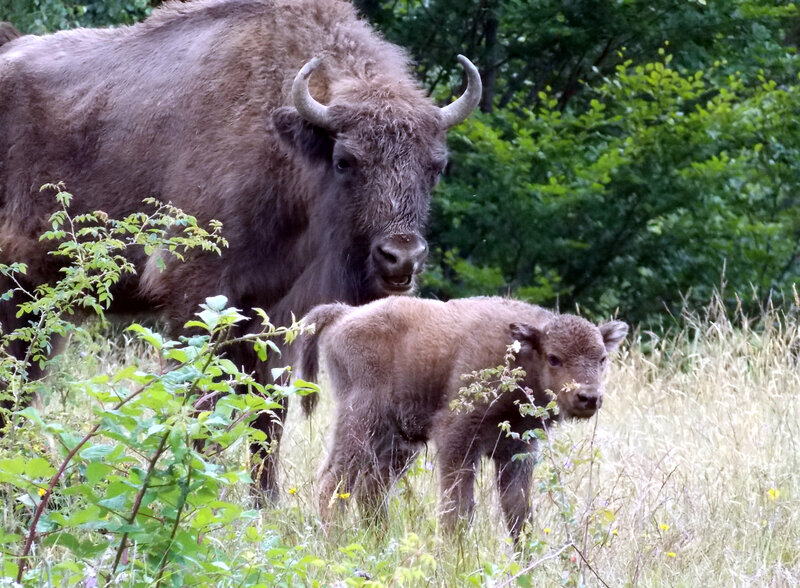 A new generation of bison conceived and born in a natural and wild environment means a good progress for the conservation of the European bison. Rewilding Europe and WWF Romania, together with local, national and international partners are working together to build a viable population of at least 300 animals by 2024, consisting of different herds roaming the area and connecting with each other. This will help to achieve the goal of Rewilding Europe to bring back this charismatic species out of the danger zone. The bison grazing and browsing ability helps maintain a mosaic of forest areas and grasslands, creating more variation and structure in the landscape. Bison, if successfully re-introduced and its habitat effectively preserved will also help maintain the ecological corridors across the entire Carpathian Mountain range, allowing natural processes to take place. You can follow the work of bison rangers in the Southern Carpathians on Tumblr while you can stay updated about the activities at the Facebook page of Rewilding Romania.